Tacos are a hugely popular food. In fact, they are one of our favorites! We are going on 3 years without missing a Taco Tuesday. One of the most polarizing topics when it comes to tacos is traditional tacos versus fusion/non-traditional tacos. Personally, we are in the camp that believes all tacos are beautiful. The tacos at CRUjiente Tacos range from somewhat traditional (the Crujiente Taco list) to gloriously untraditional. 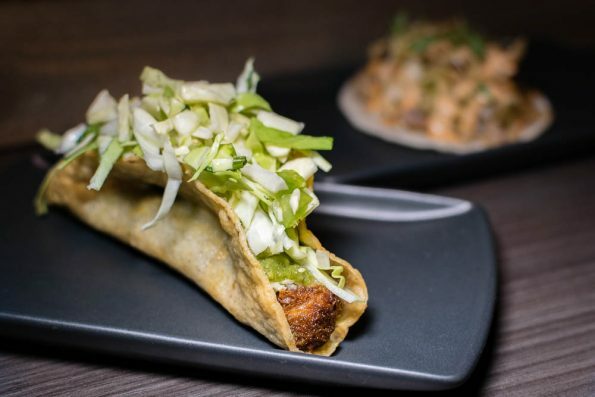 Korean Fried Chicken (gochujang, mojo de cebollin, compressed cabbage)- The first thing you notice about this taco is how delicious it smells. The scent alone draws you in like a moth to a flame. 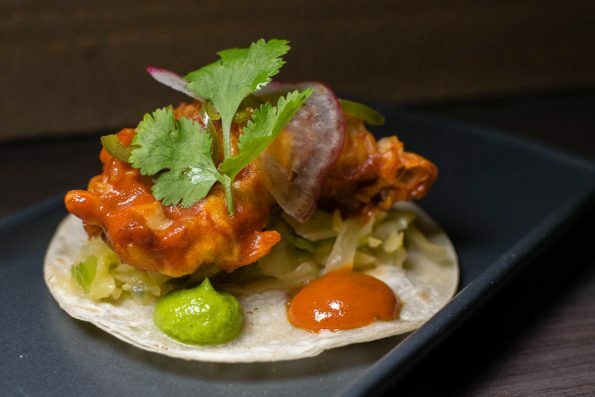 The Korean Fried Chicken Taco is the truest definition of balance in a fusion taco. Pork Belly (house quick kimchi, cilantro, sriracha aioli)- Pork belly is usually cheating. Pork belly is never really a bad thing. This taco is more than that. It isn’t a good taco because it has pork belly, it’s a good taco that happens to have pork belly in it. We may also be a bit biased because we tend to adore anything with kimchi. Crujiente (Crunchy) Pork (green chile, pepper jack, cabbage, citrus, pico verde)- At the point at which we tried this taco, we were beyond stuffed. We decided we needed to try just one more taco. We were so glad we did. The pico verde in this taco had a fantastic flavor and like every taco we tried, had a perfect balance of flavors. 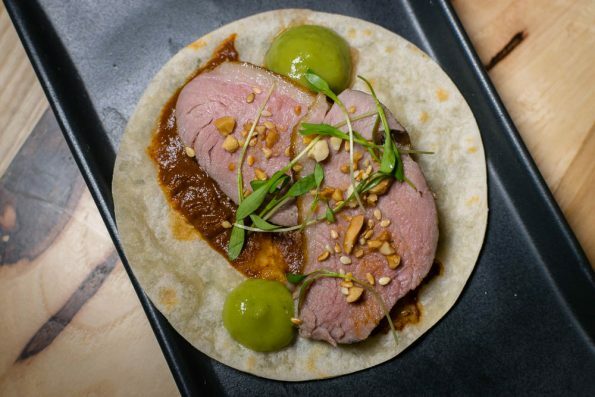 Duck (mole, sesame, peanut, verde salsa)- Duck and mole are a match made in heaven! We love ducks in every way, shape, or form. The duck was absolutely perfect in its execution. The mole and verde salsa paired together created a beautiful flavor full of richness and brightness. 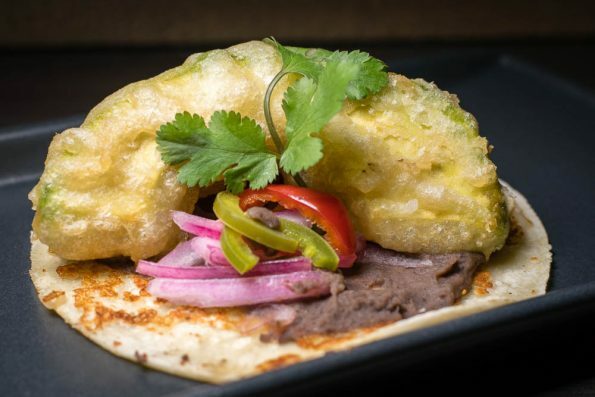 Tempura Avocado (black bean muñeta, cotija, queso fresco, red onion, jalapeño)- The Tempura Avocado Taco is the only vegetarian taco that is on the menu all the time. It is a really great execution of a vegetarian taco. It has a really smooth and pleasing texture. Additionally, the avocado doesn’t have that bitterness that usually occurs when you heat it. Now we all know that Taco Tuesday is primarily about tacos. However, a really good Taco Tuesday has a bit more to it, like cocktails and pre-taco appetizers. CRUjiente Tacos has you covered on both fronts. The cocktail program is full of surprisingly well thought out cocktails. Our favorites include The Javelina (St George Green Chili Vodka, Pineapple, Basil, Lime) and The Pisco Kid (La Caravedo Pisco, Elderflower, Lime, Berry Blossom White Tea Syrup, Mint, Grapes). 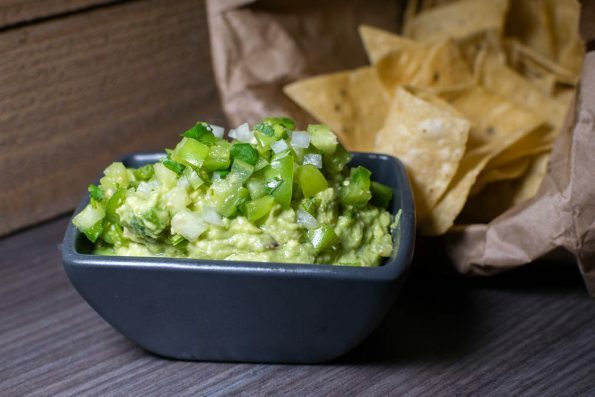 We love to have tortilla chips with our tacos and the guacamole (which uses tomatillo instead of tomato) and ceviche aren’t to be missed. Both have really bright flavors. 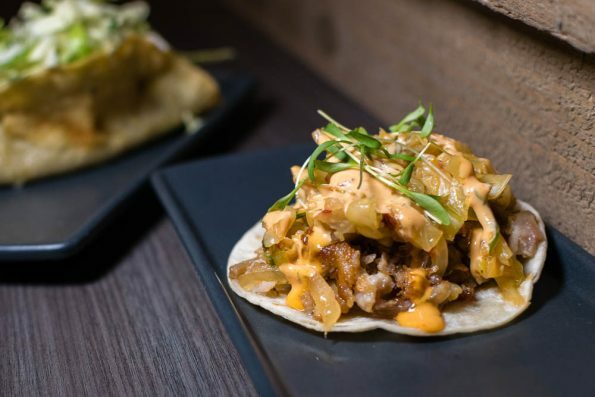 Whether you are a traditionalist or fusion fiend, there is definitely something for you at CRUjiente Tacos. There are so many wonderful options including the Taco de la Semana which is a taco that changes weekly. Have you been to CRUjiente Tacos yet? Are you a purist or do you live on the edge? We want to know! Leave a comment below or use the hashtag #GeekEats. *This article is comprised of both comped items and items in which the Geeks were not comped from two separate visits; opinions are wholly our own. View our Disclosure Policy for more info.